Asthma is characterized by symptoms of wheezing, cough, chest tightness, and shortness of breath caused by the sudden tightening of airway passages and the overproduction of mucus in the lungs. In many cases, people with asthma can keep their condition under control or minimize acute symptoms with quick-relief medications. There are times, however, when a person may experience severe, even life-threatening, symptoms which require urgent care. Respiratory distress is a state where severe breathing restriction and a reduction in oxygen intake triggers both a physical and psychological response. A person will not only feel anxiety and panic, but that anxiety and panic can also further fuel sensations of choking or suffocation. As opposed to typical asthma symptoms, some of which you experience more than you see, respiratory distress is entirely evidenced by the experience of "not being able to breathe." It is often associated with poor asthma control or a combination of factors, both psychological and environment, which contribute to an acute attack. 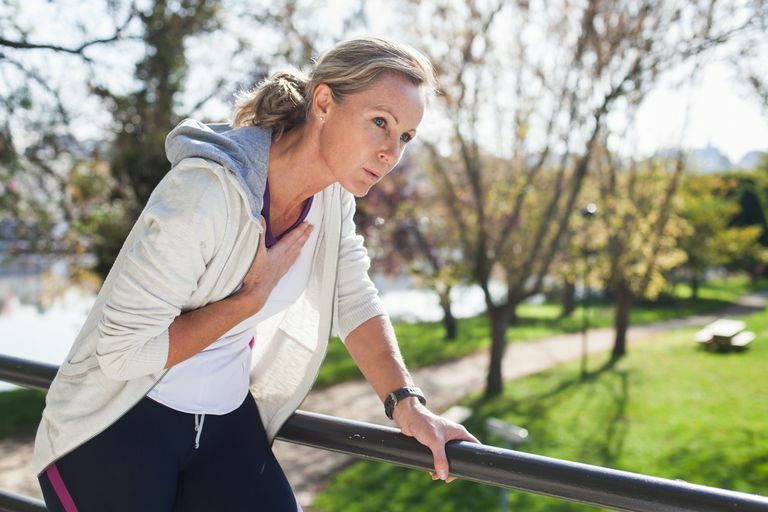 Fast breathing, known as tachypnea, is defined anything over 20 breaths per minute in an adult. Even without a count, children and adults with tachypnea will look as if they've run a sprint and are trying to catch their breath. Blue-ish skin tone, called cyanosis, occurs when the lack of oxygen causes normal skin tones to turn pale or blue. Cyanosis is most often seen in the fingers, toes, or lips. Extreme shortness of breath, known as dyspnea, occurs when a person cannot get enough air no matter how hard he or she breathes. People with dyspnea may find it difficult to carry a conversation without stopping to take a breath. Babies and toddlers may need to stop and take a breath every few second when being bottle fed. Grunting is also a common sign of respiratory distress. Grunting is the result of vocal chords partially closing during exhalation. By increasing the pressure in the lungs and slowing down expiration, grunting allows you to take in more air than from a normal breath. Nasal flaring is also typical in respiratory distress as the nostrils will automatically widen in an attempt to get more air into the lungs. Retractions ​often referred to as belly breathing, is caused when a person uses the abdomen muscles to move the diaphragm. It's an involuntary response that kicks in whenever we are in desperate need of air. Profuse sweating is caused when extreme breathing devours energy in the same way that extreme exercise does. If experiencing some or all of these symptoms, call 911 or have someone take you to the nearest emergency room. If you have asthma, inform the ER doctor upon arrival. If left untreated, respiratory distress can lead to serious complications and even death. The prevention of respiratory distress in people with asthma is no different than any other symptom they might experience. It involves the appropriate use of asthma medications, the avoidance of asthma triggers, getting vaccinated for flu and pneumonia, and visiting your doctor regularly to evaluate your respiratory health. With proper asthma control, your likelihood of severe attacks can dramatically decrease while your and quality of life and well-being can improve beyond measure. Fuhlbrigge, A.; Pedden, D.; Apter, A.; et al. "Asthma Outcomes: Exacerbations." J Allergy Clin Immunol. 2012; 129(3 Suppl): S34-S48. Krishnan, J.; Lemanske, R.; Canino, G.; et al. "Asthma outcomes: Symptoms ." J Allergy Clin Immunol. 2012; 29(3 Suppl): S124–S135. Are Flu Vaccine Side Effects More Likely for People With Asthma? Do You Have Any of These Asthma Signs? What Triggers an Asthma Attack? Is Your Chest Wheezing Caused by Asthma? How Are Allergies Connected to Asthma? What Happens to the Body During an Asthma Attack?